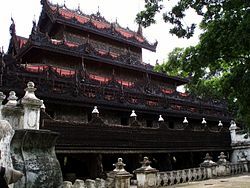 Shwenandaw Monastery was built in 1880 by King Thibaw Min, who dismantled and relocated the apartment formerly occupied by his father, King Mindon Min, just before Mindon Min's death, at a cost of 120,000 rupees. Thibaw removed the building in October 1878, believing it to be haunted by his father's spirit. The building was reconstructed as a monastery over the course of 5 years, dedicated in memory of his father, on a plot adjoining Atumashi Monastery. This article uses material from the Wikipedia article "Shwenandaw Monastery", which is released under the Creative Commons Attribution-Share-Alike 3.0 License.